Greater Noida, (17/12/2018): 74th Constitution Amendment Act states that every city should have its own municipal corporation, Noida is still without a municipal corporation. 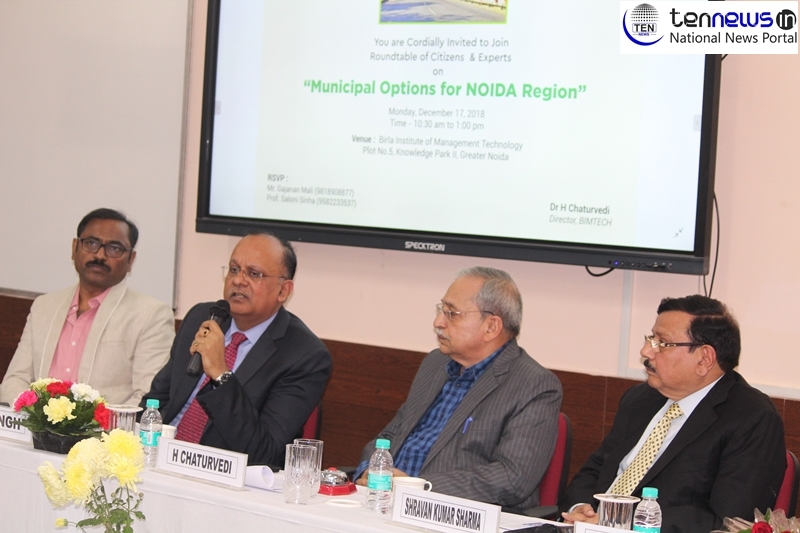 On Monday, BIMTECH and Ten News Organised Round table of Citizens and Experts on ‘Municipal Options for Noida Region’. The focus of the round table was to discuss about the Need of Municipal Corporation for Noida- Greater Noida Region. The discussion session was moderated by Dr. H Chaturvedi, Director BIMTECH and chaired by DM of Gautam Budh Nagar Brajesh Narain Singh, Noida MLA, Pankaj Singh, Om Prakash Divate, Thane Municipal Deputy Commissioner, Dr KK Pandey, Professor, Urban Management Expert from IIPA and Shravan Kumar Sharma, Former Commissioner Meerut. The event saw a turn-around of about 50 dignitaries from various organizations- Government, Civil society, Constitutional Expert, Industry, Active Citizens , Associations etc. Noida MLA Pankaj Singh made his remarks on the issue and showed immense interest for Municipal Corporation. Om Prakash Divate, Municipal Corporation Commissioner, Thane gave a presentation on Thane smart city Limited and spoke about the differences between the Infrastructure and Healthcare in Noida and Thane. “A municipal corporation is required to maintain the facilities and have a proper care. Many dignitaries spoke about several cases like dog bites etc. To overcome this we need a proper structure that can be only solved by Municipal Corporation,” he stated. Jewar MLA Dhirendra Singh, speaking about the need for Municipal options for Noida region said ” In India local bodies are always there and in Noida and Greater Noida the need of these types of local bodies is increasing day by day, so the government should give a thought about this basic need of the people of Noida”. The successful event was able to being together diverse minds and was able to sensitize the issue. SK Jain, President, Noida Sector 18 Market Association, Sadhna Sinha, Mahila Shakti, Rajkumar Bhati, Samajwadi Party Leader, Ranjan Tomar, Advocate, Delhi High Court and many other eminent citizens were also present on the occasion.